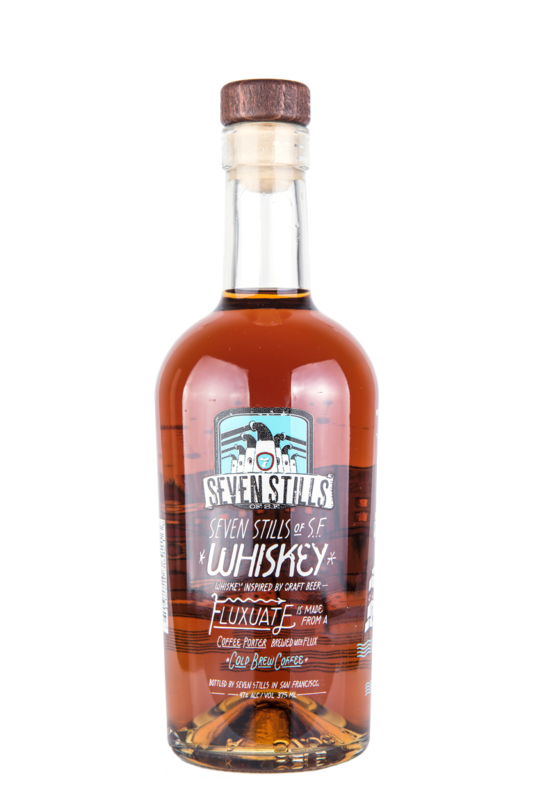 Seven Stills of San Francisco‘s next act in its distilled-from-beer whiskey line is Fluxuate, which is distilled from a coffee porter. To pump up the coffee flavor, the finished product is proofed down not just with water but also with a small amount of cold brewed coffee from a company called Flux (hence the name). The nose is, surprisingly, not overwhelming with coffee but rather offers a dense Port wine note, enhanced with vanilla, dark chocolate, and spice. The coffee is far more intense on the palate, where it meets notes of licorice, dusty wood shavings, gingerbread, and fireplace ash. Additionally there is an ample grain character here, particularly on the finish, where it successfully challenges the coffee notes for dominance. That said, the balance of flavors here is really quite impressive, the coffee and more traditional whiskey elements coming together quite beautifully. Think a denser version of an Irish coffee and you’re on the right track.